An employee wearing a mask of Donald Trump poses for a photograph at the Shenzhen Lanbingcai Latex Crafts Factory, October 18, 2016. 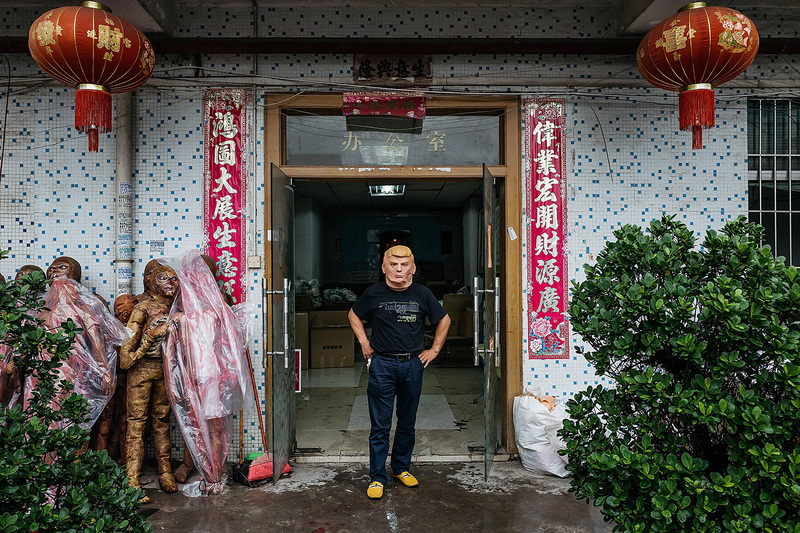 The factory produces costumes and masks, including small-scale production of Donald Trump masks for local distribution within mainland China. President-elect Trump must safeguard freedom of the sea forcefully and often. America’s incoming chief magistrate can start by reaching across the aisle and incorporating a passage modeled on John F. Kennedy’s 1961 inaugural into his inaugural address in January. Kennedy’s bracing language can be repurposed to counter China’s challenge to the liberal maritime order on which all trading nations’ prosperity hinges. “Let every nation know, whether it wishes us well or ill, that we shall pay any price, bear any burden, meet any hardship, support any friend, oppose any foe,” to assure freedom of the sea. This much we pledge—and more. To old allies, we pledge the loyalty of faithful friends. United, there is little we cannot do. Divided, there is little we can do—for we dare not meet a powerful challenge at odds and split asunder. To other seafaring peoples, we hope to welcome you into a fraternity of maritime liberty. We shall always hope to find you strongly supporting your own rights. And we implore you to remember that, in the past, those who foolishly sought safety by riding the back of the tiger ended up inside. So it will be today in the China seas. Trump should put steel behind unflinching words. Upholding freedom of the sea is about waging diplomacy toward influential audiences. What audiences? U.S. naval officialdom seems to think China’s navy is the principal audience for “freedom-of-navigation” demonstrations: a ship or plane does something that contravenes Beijing’s unlawful claims, Chinese mariners on scene see it, the point is made. Not so. China’s navy is just a tool of Chinese statecraft. Influencing its views makes little difference. Shipborne diplomacy should mold opinion in Beijing, in allied countries such as Japan and Australia, and among vacillating friends—notably Duterte’s Philippines. Upholding freedom of the sea means discomfiting antagonists while heartening friends and allies. To sway perceptions in America’s and liberty’s favor, the U.S. Navy must defy China’s lawlessness. It must do so regularly. And it must explain its actions—and why they matter—in the press. If a tree falls in the forest and no one hears it, it may as well not have fallen. No one hears it. Likewise, if American spokesmen don’t explain a freedom-of-navigation operation, it may as well not have happened. It will do precisely nothing to advance the cause of nautical liberty. Let’s speak frankly, act boldly, and tell our story well. On U.S.-China economic issues there is not much President Trump can do constructively in the next year, as China’s reforms are on hold until political uncertainty is resolved at the Party plenum in November 2017 (and probably longer). The United States can use that year to put itself in a strong position to deal with China on economic issues. The new president’s first trip to Asia should aim to bolster traditional alliances with Japan, South Korea, and Singapore. After some loose talk during the campaign, it will be important to reassure allies that the U.S. is not withdrawing from Asia in either the security realm or the economic one. President Trump will hear from Asian partners about the importance of the Trans-Pacific Partnership (TPP) or something similar: a deep agreement that involves policies and regulations about investment, state enterprises, intellectual property rights, labor, and environment. The best longer-term strategy for dealing with China is to create a successful regime of open trade and investment that China will aspire to join. It is a shame that TPP has been mischaracterized during the campaign, and it may be difficult to resurrect it under the same name. China is not one of the TPP countries. The U.S. has much more balanced trade and investment relations with the TPP partners than with China, so it is smart to build on that to deepen integration that benefits U.S. firms and workers. Starting a trade or currency war with China is not a good idea. Labeling China a currency manipulator is fighting the last war, as China recently has been intervening to keep its currency high, not low. If the U.S. imposes high tariffs on Chinese imports, then the smart move for China is to retaliate. China is too big to be bullied in this way. One area in which the U.S. can constructively take a tougher line on China is to limit the acquisition of U.S. firms by Chinese state-owned enterprises. This is the big asymmetry in the relationship right now. China remains highly closed to foreign investment in many important sectors: media, telecommunications, transportation, finance, energy, and more. Meanwhile, Chinese state enterprises are leveraging their protected markets at home to buy their competitors overseas. This legislation will have to be crafted carefully but it is reasonable to prevent acquisitions by state-directed firms from countries that have no investment agreement with the U.S. The U.S. and China have been negotiating a Bilateral Investment Treaty, but progress has been slow and the political uncertainty in China makes it unlikely that China would make an attractive offer within the next year. It makes sense to continue those discussions, but progress is likely to depend on the two issues above: whether the U.S. is pursuing something like TPP, and restricting the asymmetric access of Chinese firms to the U.S. market. There will continue to be various dialogues between the two governments, and the form of the dialogues is not a very important issue. The existing Strategic and Economic Dialogue has become too big and ceremonial to be much use. Ideally, the one big dialogue can be broken into its constituent parts. It will be difficult to make progress on economic issues in the next one to two years, but it is important to keep on talking. American citizens have been distracted, trapped in a months-long, nationwide reality television show with contestants Hillary Clinton and Donald Trump. Already disinclined to pay much attention to the country’s foreign affairs, few beyond those in policy circles have worried as Philippine President Rodrigo Duterte made overtures to China over the last few months and flounced his country’s long alliance with the United States. Arguably, with political and military bilateral relations at stake, the first thing a President Donald Trump might want to do is to reach out and reengage with Manila, and to push back against China’s steady assertiveness in the region. Some believe, however, that the U.S.-Philippines relationship is quite safe. Duterte has postured to the people, telling President Obama to go to hell and threatening to end joint military exercises between the two countries, but his defense secretary, Delfin Lorenzana, is actually an establishment pick with close and long relationships with his American military counterparts. He spent years overseas as a defense attaché and worked at the embassy in Washington, D.C. Still, events in the Philippines have shown how quickly China can step into the picture when the U.S. isn’t looking. This takes us back to the Asia pivot. Even before dealing with the Philippines, the first thing Trump should do in regards to China when he takes office is to reassess, redefine, and recommit to the Asia pivot. Any action with the Philippines or any other country, or comment on any incident (including current events in Hong Kong) should happen as part of a greater strategy in the region. The United States has long denied that the pivot has been meant to contain China. But China’s own actions, from the South China Sea to its unwillingness to pressure a nuclear North Korea, has rattled its neighbors. If America’s intention is to ensure stability in the region, its pivot will mean curbing China’s power plays. Despite the fact that it was then Secretary of State Hillary Clinton who rolled out the pivot, it is not inconceivable that a Trump administration would take up the mantle. Peter Navarro, one of Trump’s policy advisors, recently observed in a piece in Foreign Policy that “U.S. partners like Japan, South Korea, India, and even Myanmar and Vietnam continue to seek closer ties with Washington across the spectrum,” going on to add that a Trump presidency would increase the size of the U.S. navy. That would certainly show that this time, the rebalance will be a real one. Another possibility for Trump might include a first visit as president to Asia, with a policy speech delivered in Japan. Trump’s major challenge will be his campaign commitment against the Trans-Pacific Partnership (TPP). He will need to demonstrate some kind of economic pillar to the pivot, but without the TPP. That might not be possible. Ash Carter, writing in the latest issue of Foreign Affairs, says that “China’s model is out of step with where the Asia-Pacific wants to go; it reflects the region’s distant past, rather than the principled future the United States and many others want, and its approach is proving counterproductive.” The defense secretary has doubled down on the pivot—Trump needs to do so, as well. Not surprisingly, I clash with David Dollar on the best approach to Sino-American economic relations. We agree that next year may be unproductive due to political events in China, just as this year has been constrained by political events in the U.S. We also agree that the Strategic and Economic Dialogue is more bloated than beneficial. Further, there is probably a consensus that the best long-term strategy with regard to China begins with a healthy and vibrant American economy. Even with regard to China, President Trump should start with domestic economic policy. Sound corporate tax reform, as a leading example, can boost the competitiveness of American workers and companies both. There is no consensus on the Trans-Pacific Partnership (TPP). Trade agreements should not be strategic tools, rather they should offer hefty economic benefits. When I read the (entire) TPP a year ago, I did not find much in the way of net economic benefits. When the International Trade Commission evaluated the TPP six months ago, they drew similar conclusions. There is no point being comprehensive, either in the number of parties or the number of issues, when the ensuing results are too weak to genuinely constitute a new, beneficial set of rules. Nor should the U.S. be especially concerned about antagonizing China economically. It’s true that the criticism of Beijing’s exchange rate policy long made by protectionist groups, and picked up by the Trump campaign, is overblown. Trying to link the value of the RMB to American jobs requires contortions, since the most salient evidence shows they are not meaningfully connected. However, the President-elect is right when he notes that the U.S. has greater leverage. China can certainly retaliate against American trade and investment actions, but unbalanced market access means it has far more to lose. The important matter is whether any sanctions make sense for the U.S. David suggests limiting acquisitions of American assets by Chinese state-owned enterprises (SOEs). This would be essentially meaningless. Private Chinese investors have always outpaced SOEs in the American market and the surge in Chinese investment this year is being driven by private or quasi-private companies such as HNA. On the security side, a private Chinese firm is just as likely as an SOE to turn sensitive technology over to the People’s Liberation Army. Neither has the option to resist coercion to this effect and they should not be treated differently. A more fruitful approach would be to target IP theft, including cyber. China attacks U.S. comparative advantage in innovation by stealing IP and retaliating along these lines is justified if it hits the right targets. Chinese firms that have benefited from stolen American IP should be barred from the market for a length of time commensurate with the theft. Chinese behavior and Trump campaign rhetoric make it almost impossible to open the next phase of the bilateral economic relationship with more U.S. cooperation. The Trump administration should bear in mind that Chinese domestic politics will be sensitive next year. But it should make clear that China must become a better partner, or the economic relationship will shrink. The bilateral relationship between China and the United States is structured in such a firm manner that a change of presidency on the U.S. side or a change of top leadership on the Chinese side is unlikely to be as earth-shaking as some analysts make it out to be. The American election system has worked. China works with whomever lands in the White House, regardless of what was said on the campaign trail. The set of issues for both countries—from economics, to security, to regional and global governance—will remain unchanged under President Trump. So, the expectation from around the world is that neither Beijing nor Washington seeks to rock the boat of regional/global tranquility. Trump did not hold public office or rise to any military rank. There is little knowledge about him in China. Also, his election support team did not make as strong an effort to relate to Chinese think tanks as that of the Democratic candidate. So, from this point on, then, Beijing should make a great, proactive effort to relate to the new administration in Washington, D.C. Also, Beijing won’t be the only one in town, and it will have to compete hard for Trump’s attention. On some of the headline issues, China was NOT a major campaign issue for either Trump or Clinton. Neither candidate chose to give a speech on China policy at any considerable length. That is a reflection of the reality that China was NOT on the mind of average voters. It was rather the China think-tankers that projected a different image. It would be unwise and counterproductive for China to take Trump’s campaign rhetoric at face value. After all, Trump will be working within an established and mature U.S. governing system. Among many other channels of communication between Beijing and Washington, the bilateral Strategic and Economic Dialogue should continue, as it offers a channel for a wide range of bureaucracies on both sides to relate to each other. Each side must find ways to make the dialogue more productive to willing participants. In terms of managing East Asian regional security, well, it is very, very important to keep in mind that all countries and societies dotting the maritime space—not just the United States and China, regardless of military alliance arrangements in place or desired—have a say about its governance. Although the populations of these countries do not get a vote on either Beijing’s or Washington’s course of action, there is a silent majority out there. That preference, though often unarticulated in the Western or Chinese media, will be the decisive check on American and/or Chinese behaviors. It could be misleading for people to take their cues just from what President-elect Trump said on the campaign trail, such as his promise to impose a 45 percent punitive tariff on Chinese imports and his threat to label China a currency manipulator. Past U.S. presidential candidates also made crazy vows about China during their campaigns, but forgot them quickly once elected. What’s more, in Trump’s case, his proposed punitive tariffs wouldn’t pass Congress or get past the U.S. business community. It reflects the same spirit of President Xi Jinping’s congratulatory message on Wednesday to President-elect Trump, a message about no conflict, no confrontation, mutual respect, and win-win cooperation. Trump also previously expressed that he was willing to meet Kim Jong-un of North Korea and to improve ties with Russia. Such a tone and such gestures are welcome given that the U.S. government has intervened excessively in the past in other nations’ internal affairs and U.S. leaders have had a tendency to lecture other countries. The U.S. seems to believe that by imposing pressure and costs on other nations, it will bring them to their knees. In reality, it often makes them more united at home and more determined and stronger in resistance to such pressure. The Obama administration is responsible for the chaos in Syria and some other parts of the world. With its pivot to Asia strategy, Obama also is partly responsible for the vicious action/reaction-cycle with China in the East- and South China Seas, perceived widely by countries in the region as a China-containment policy according to a recent study from the Center for American Progress. Despite her contribution to U.S.-China relations as secretary of state, Hillary Clinton’s hawkish instinct was deeply concerning to those who feared her election could further raising tensions in the China-U.S. relationship. Kishore Mahbubani, dean of the Lee Kuan Yew School of Public Policy at the National University of Singapore, said last week on CNN that Clinton, if elected, would have to unlearn many of the instincts she had in the past and develop new instincts. It is true that while Trump’s victory speech contains encouraging messages, he still has not made a foreign policy speech, especially regarding China. It is unknown who will become his secretary of state and his national security advisor, and who will staff his foreign policy advisor’s team. The growing interdependence between the two largest economies and the huge potential for mutual cooperation are compelling reasons for the two nations to expand cooperation and better manage their differences, differences that may exist for a long time to come. For example, China has successfully solved its land border disputes with 14 of its neighbors, a great track record. The U.S. needs to show more confidence that countries in the region have the wisdom and ability to solve their maritime territorial disputes through bilateral negotiations over a period of time or shelve the differences for the next generations. I’m only going to suggest one thing that President Trump can do to deal with China. It may seem a small item on a crowded agenda, but it’s an important one and it needs Trump’s immediate attention. Trump will be sworn in as president the same month that China’s Foreign NGO Law goes into effect. That law is sweeping in its scope. It targets not only human rights and advocacy organizations, but also many nonprofits that we tend not to equate with NGOs yet are critical to a healthy U.S.-China relationship: trade, business and professional associations, charitable foundations, educational institutions, labor unions, think-tanks, and arts, culture, and sporting organizations. Over the last 25-30 years, American NGOs have played an important role in promoting people-to-people exchanges, building the capacity of Chinese government and nongovernment organizations, and providing technical and policy support to help China address the many problems facing a rapidly developing country. Many of them developed close, long-term ties with Chinese government agencies, universities and research institutions, and social organizations of all varieties. This constructive, tight-knit cooperation between Americans and Chinese is now threatening to come unraveled. In the last few years, as President Xi Jinping has exercised a more muscular, nationalistic approach to bolstering the rule of the Communist Party, China’s civil society, media, and universities have come under siege. Rights lawyers and activists have been rounded up, and Chinese media and universities have been told to toe the Communist Party line and resist Western influences. This year saw the passage of the Foreign NGO Law, a law which requires all overseas NGOs (including those registered in Hong Kong, Macao, and Taiwan) to either register a representative office or report their activities in China. Many American NGOs and nonprofits fear this law may make it much more difficult for them to operate in China, and some have considered pulling out. A Trump administration should work closely with Chinese leaders to ensure that the law does not set back years of constructive collaboration between Americans and Chinese. It should closely monitor the Foreign NGO Law to ensure the law is implemented fairly and impartially so that certain NGOs are not punished or discriminated against simply because of the issues they address. Unfortunately, the Foreign NGO Law threatens to do the reverse by raising high barriers to entry for foreign nonprofit organizations. A foreign company looking to make a profit by setting up factories to produce components for smartphones will have greater access to China than a foreign NGO seeking to improve wages and working conditions in those factories. In short, a healthy U.S.-China relationship depends on a strong civil society (both on the U.S. and Chinese side) to support the work of both sides on critical issues such as rule of law, governance, and sustainable economic growth that will benefit the very working-class families that voted Trump into the White House. During the infotainment program called “The Candidate,” we saw two characters named Trump. One was a tough guy who never loses. If this character takes office, he’ll slap tariffs on China, enhance secondary sanctions on North Korea that will hurt the Chinese finance industry, squeeze more money out of Japan and South Korea to support even stronger U.S. forces in Northeast Asia to contain China, increase arms sales and diplomatic support to Taiwan, enhance security cooperation with Vietnam, India, and other regional partners, and build up the U.S. Navy and deploy it more frequently in the South China Sea. I don’t expect Xi Jinping to fade away in the face of these actions, so we will be in for an intensified arms race and (at a minimum) rising tension in U.S.-China relations that will alarm our allies and security partners who live closer to China than we do. The other Trump was the practitioner of the art of the deal. If he takes office, he will look for an economic and strategic grand bargain with China, some version of a regional condominium that reduces American resistance to the spread of Chinese military and political influence in Asia in exchange for greater opening of the Chinese economy to U.S. exports and investment, Chinese investment in U.S. infrastructure—and perhaps a few permits for Trump hotels and towers thrown in as a side payment. I imagine Xi Jinping would like this deal. But Japan, South Korea, Taiwan, the ASEAN countries, and Australia would no longer be able to count on U.S. support as a counterbalance to Chinese influence, and they’d either have to tilt to China or (in the case of Japan and perhaps even South Korea and Taiwan) decide to build up their independent military capabilities or even go nuclear. Neither of these outcomes is desirable. I therefore hope that President Trump will play neither of these characters in office, but will build on the well-balanced China policy that President Obama and Secretary Clinton crafted. Under this policy, the U.S. sought cooperation with China where common interests existed, such as climate change, North Korea, and nonproliferation, and where interests clashed—such as over the issue of whose navy would dominate the South China Sea—the U.S. neither overreacted nor retreated, but held firm to its positions on lawful resolution of disputes and freedom of navigation. Trump should defend American interests with respect to Taiwan, the Senkaku Islands, Chinese economic protectionism, and human rights. But to do so effectively, he has to focus on those factors that will determine how both China and our Asian allies assess U.S. power: our domestic problems. We need to bridge political polarization, diminish inequality, and rebuild our infrastructure if we are to have the credibility that we need to maintain our influence in Asia. If we can’t make things work at home, we will rightly be seen as a has-been power, and other nations will act accordingly. It’s a surprise to me that so many Chinese commentators think they know what to expect of Trump. Trump’s pronouncements against the cliché of “foreign entaglements” can be taken to mean that he will neglect or outright disavow alliances, leaving China to take its pick of nations left on the dangling end of an American relationship. China can flip more conventional ASEAN allies as has been done with the Philippines, or pursue a “special” relationship with the U.K. of the sort that India is building; offer closer friendship to Mexico, Egypt, Morocco; put more pressure on Singapore to abandon strategic and educational partnerships with the U.S.; isolate Taiwan by befriending the nations of Central America and the Caribbean. If the United States were to eschew international obligations —including all of those relating to carbon emissions—the possibilities for China to assume the initiative, or even unchallenged leadership in regions of its choice, would appear to be unlimited. Of course Trump has also said he wants America to “win” at everything everywhere. He has singled China out as the U.S.’s main competitor. He claims that China siphons off American jobs, uses currency manipulation and illegal dumping to undercut American exports and trade balances, created a fictional “global warming” panic to impose crippling regulation on American industry, and that the totality of Chinese grifting has produced the “biggest theft in American history.” How seriously Trump takes these charges is less important than the fact that he has spent a couple of years ensuing that a major portion of the American public believes them. Even if Trump were able (he is now learning that he isn’t) to just abandon American military, economic and security obligations throughout the world, he would clearly make China an exception—which means, by extension, that he would be right back in the South China Sea and the Korean peninsula, and perhaps more inclined than the current U.S. administration to expand the U.S. presence in Africa for no other reason than to obstruct further expansion of Chinese presence there. With or without expertise and tempered counsel, Trump will make it a point to get in China’s way, which the U.S. has not done for almost four decades. There is a more potent danger for China in Trump’s election. Like Britain’s exit from the European Union, Trump’s election is one of the more salient symptoms of the plateau of globalization. Europe and North America are no longer willing to risk their standards of living in exchange for more fluid access to markets, labor, and resources; the resulting tensions have depleted their political reserves. Trump’s inclination is to put a magic membrane around the U.S. that keeps jobs and technology in and immigrants out. His election is a signpost pointing toward tariffs, import restrictions and military enforcement of trade and resource privileges (including transport of American imports and exports through the South China Sea). Trump as some kind of neo-isolationist is merely one of his many illusions. Pity the Chinese human rights campaigner or intellectual who looked to the United States as a beacon, a model, a source of pressure or merely a font of rhetorical succor. What now under President Trump—what signals can he give to China, what signals will he give to China, and what cues will President Xi Jinping be looking for and receive? In 1989, American journalists brought China’s Tiananmen demonstrations to living rooms and the world, the students’ Goddess of Democracy rhyming visually and symbolically with the Statue of Liberty. The U.S. Embassy was a space of asylum for Fang Lizhi. American lawmakers used their bully pulpits. Sanctions were imposed, for a time, and some kind of bottom line was visible if not always totally clear. The State Department published its annual Human Rights Report—never much more than an annoying goad in the Chinese side, to be sure, but at least a rhetorical reminder that human rights were (are) a fundamental part of U.S. foreign policy. But what happens when a U.S. president models himself after strongmen? Trump’s praise of Putin, in no way a human rights paragon, is not encouraging. Will the U.S. have any credibility, even if it wished to have, to protest the beating or harassment or jailing of a Chinese reporter when Mr. Trump’s anti-journalist rhetoric and the actions of his supporters have been plainly on view for the world to see? Will a Chinese labor activist feel any moral support at her back if a Trump administration turns up the heat on domestic expressions of dissent? Will a Chinese NGO, fighting a draconian new law and regulations, find any joy from the U.S., or only the negative example of the potential defunding and harassment of Planned Parenthood, itself an NGO, in the U.S.? To be clear, Republicans have traditionally been strong on holding China to human rights standards; a Republican was president during Tiananmen. This has been a bipartisan issue. But President-elect Trump is a Republican in name only, and his proclivities seem to tend much more to the authoritarian. In the current atmosphere within China, I can even imagine President Xi thinking that some compromise on trade or currency might be a reasonable exchange in return for a more isolationist Trump administration giving a freer hand in the South China Sea and a more authoritarian Trump giving a freer hand at home. What a bargain. Even if these are not Trump’s intentions, the signs that they could be are there. And if he doesn’t want these things to happen, he will need to change the signing firmly and quickly to avoid a very tragic result. President-elect Donald Trump needs to move quickly to clarify his approach to the Asia-Pacific. Unlike Secretary Clinton, Trump does not have a track record on how he views U.S. interests and policy objectives in the region. Foreign observers have naturally followed his campaign rhetoric closely to gleam insights into what types of policies he might pursue once in office. But the emerging articulations of Trump’s vision for the Asia-Pacific contrast strongly with many of Trump’s campaign promises. The result is a potentially dangerous gap in expectations. Beijing has concluded that Trump’s transactional, businessman predispositions will lead him to be less inclined to inject human rights and values into his policies and dialogue with China. This may be so. But Chinese are also convinced that Trump’s election signals the ushering in of a period of American isolationism in which Washington will retreat from the world, including from Asia, and abandons its allies. This prospect is warmly welcomed in Beijing. Some Chinese scholars have gone a step further even by contemplating strategic opportunities for Beijing in the South China Sea or in their relations with Southeast Asian states as a consequence of American withdrawal. There is an overarching expectation that Trump’s election will mean less strategic pressure on China in the region. China may be in for a rude awakening. In the last two days, the policy pronunciations that have emerged from Trump’s advisors paint a very different picture of the president-elect’s Asia policy. In an article for Foreign Policy, Alexander Gray and Peter Navarro liken Trump’s vision for the region to Ronald Reagan’s “peace through strength” strategy, wherein a robust a U.S. military presence in the Pacific, strong support for Taiwan as a “beacon of democracy,” and U.S. alliances as “bedrocks of stability in the region,” are key components. To support such objectives, the advisors suggest Trump will seek to repeal defense sequestration, rebuild the U.S. Navy, and stand up to Chinese aggression in the South China Sea. Gray and Navarro’s “peace through strength” vision sounds quite different from the expectation of U.S. retrenchment that many Chinese developed over the course of the campaign. Paraphrasing former Singaporean Prime Minister Lee Kuan Yew, the authors of the article assert that U.S. military presence in the Asia-Pacific is essential to promote U.S. liberal values and serves as a critical source of regional stability. They criticize the Obama administration’s weak implementation of the military component of its “pivot” policy, precisely the aspect Beijing perceives as being most hostile to China, and explain that despite Trump’s suggestions that America’s allies were not contributing their fair share to sustain U.S. security commitments, his commitment to U.S. allies was unquestionable. The potential danger is that Beijing’s expectations about Trump’s China policy—that he will pay less attention to the Asia-Pacific and place less emphasis on U.S. alliance relationships—may not come to fruition. This could result in the relationship beginning on an uneasy or negative footing. Former president George W. Bush, who I worked for on the National Security Council staffs, always operated from a principle of “no surprises,” which he believed was a key stabilizing feature in the relationship with China. In that spirit, the first thing the Trump administration can do to promote a positive and constructive U.S.-China relationship is provide a clear articulation of his China and Asia policy in order to allow countries in the region to set realistic expectations for where and how they will be able to work with the new U.S. administration, and areas where policymakers will need to address and manage differences.